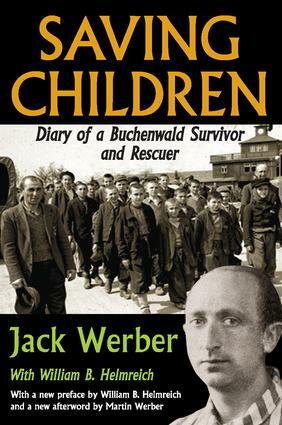 In Saving Children, Jack Werber describes in detail what life in Buchenwald was like, painting a haunting picture of his daily struggle for survival. But Werber did more than survive; he made saving children his special mission. In what is one of the most amazing stories of the Holocaust, Jack Werber helped to save the lives of some seven hundred Jewish children who had arrived at Buchenwald in late 1944, including Nobel Prize-winner Elie Wiesel and Rabbi Israel Meir Lau, former Chief Rabbi of the State of Israel.At great personal risk, he arranged for the children to be hidden in various barracks with false working papers. He and his group actually started a school where the children studied Jewish history, music, and Hebrew. These activities gave the youngsters hope that they might survive and ultimately most of them did.Werber's entire family�his wife, daughter, parents, and seven siblings�were all murdered by the Nazis. "There was no reason to go on," he had thought, but seeing the children transformed his outlook. He resolved to prevent them from meeting his daughter's fate. Out of 3,200 Polish prisoners who entered the camp together with Werber, only eleven were alive by war's end. Of those, he was the only Jew.